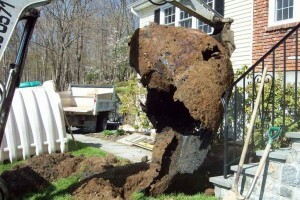 Precision Excavating Inc. has installed hundreds of septic tanks in Westchester and Putnam, NY over our 35 years in business. Septic Tanks – How do they work? Septic tanks are the first major component in the septic system. The solid waste is contained in the tank and prevented from entering the septic fields by a baffle (if properly working). The size of septic tank required is determined by the number of bedrooms in a house. (The only exception would be in pre-existing situations where the appropriate size tank cannot be accommodated in the space available.) Many people mistakenly believe a larger tank will alleviate or stop the property from becoming wet from heavy water usage in the home. However, the tank’s primary purpose is to hold the solid effluent and is usually full with waste water within about a week of installation or pumping. The use of a plastic or concrete tank is usually determined by site access. If the area is accessible for a boom truck to enter then a concrete tank is always recommended. Both concrete and plastic tanks have a long life expectancy, however, the concrete tank can withstand more pressure from either heavy soil or vehicles. Pricing is generally similar. 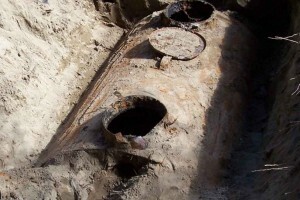 Many steel tanks were installed in the 1960’s and 1970’s and are now old and corroded. If you have an old steel tank it should be replaced since they have been known to collapse as they age and rust through. This can be a safety hazard. What’s left of an old steel tank. Estimates for homeowners are free of charge.